Pasta e Fagioli may be hard to pronounce ("Pasta Fazool"), but it's so easy to enjoy. 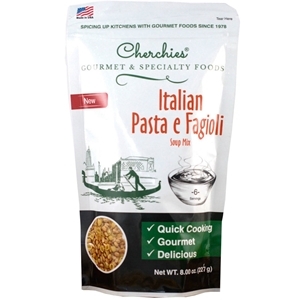 Chock full of nutritious white beans, savory seasonings and petite pasta shells, it was developed from our Italian family recipe. This classic soup has been enjoyed by many people throughout the world. It makes approximately 6 (1 cup) servings. Northern white beans, enriched macaroni product, salt, dehydrated vegetables (onion and garlic, parsley) sugar, coriander, oregano, basil, black pepper, thyme, celery, white pepper, hydrolyzed soy protein, oleoresin celery, and silicon dioxide added to prevent caking. Allergens: Contains wheat and soy.